Body mounting your metal detector control box can help protect your detector and alleviate possible arm strain from long hours of metal detecting. This can be of extreme importance for anyone suffering from tendonitis. Body mounting also works well work working in steep terrain or while wading in deeper water. This nylon harness can be used to hip mount your detector or by shortening the straps chest mount the control box. A short snap-on section allows the control box to be easily removed from the harness without actually removing the harness from your body. The oversized plastic quick buckle allows for easy donning. 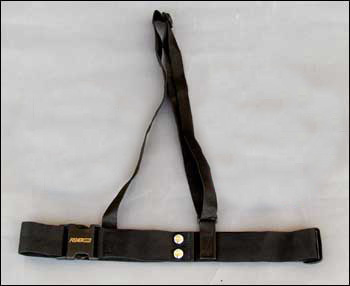 This harness may be used with any detector featuring built-in belt loops. The cordura holster above also works well with this harness to provide the control box with extra protection.